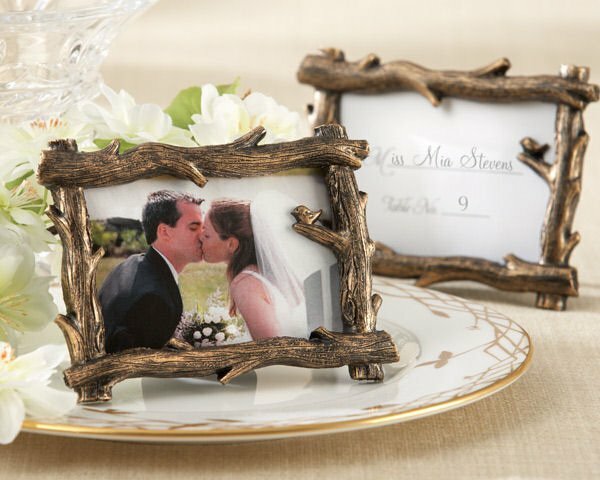 Human nature may have brought the two of you together, but Mother Nature had a hand in designing this beautiful Tree-Branch Place Card/Photo Holder favor that your guests will love to take home with them. Exquisitely detailed tree branches for a rustic frame with a tiny bird perched on a twig. These wedding frames favors each measure 3 1/2" x 2 1/2" (place cards are included). Will hold a 3 1/16" x 2 3/16" photo or card. How do they stand up? They're a regular easel stand. What is the size of the Tree-Branch Place Card/Photo Holder? The Tree-Branch Place Card/Photo Holder measures 3 1/2" x 2 1/2" that can hold a 3 1/16" x 2 3/16" photo or card. Is it possible to purchase one of the Tree-Branch photo holder to make sure they will work for our event? Yes! You can order a sample of the Tree-Branch Place Card/Photo Holder. Just add quantity 1 and your zip code to add it to your cart and complete the checkout. Hi I received my order, they are beautiful but I want to know If I can use it in a horizontal as well as in a vertical position? Unfortunately, the Tree-Branch Place Card/Photo Holder is only available in the horizontal position. This wedding frame favor measures 3 1/2" x 2 1/2" (place cards are included) and can hold a 3 1/16" x 2 3/16" photo or card. Hi, is there a frame that holds a 2.5 by 3.5 wallet size picture? It's called a tree branch picture. Can the frame be used horizontal and vertically? The Tree-Branch Place Card/Photo Holder can only hold a 3 1/16" x 2 3/16" photo. This frame can only be used horizontally, as shown on the photo.